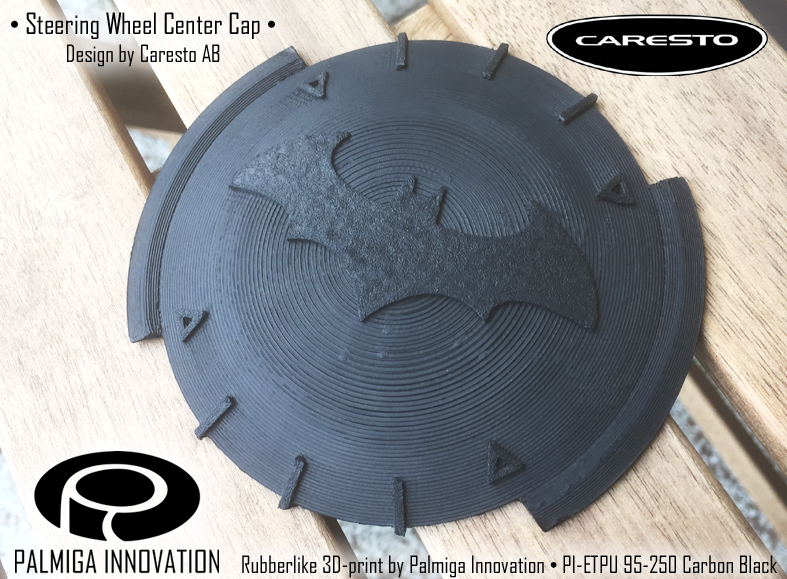 Palmiga Innovation – Rubber3Dprinting.com had the absolute privilege to contribute with 3 pieces of rubberlike PI-ETPU 95-250 Carbon Black 3D prints to this amazing build by Caresto AB. This one of a kind car is built by Caresto to be part of Gumball 3000, 2016. 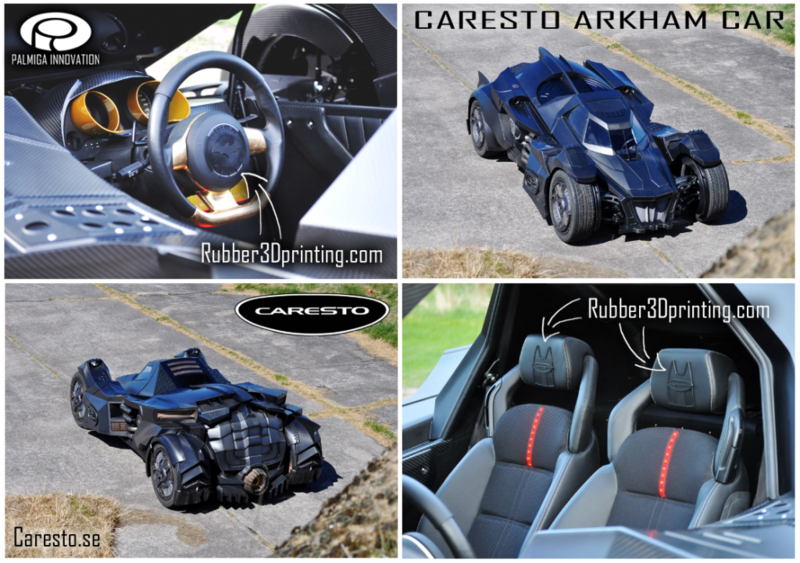 The design is based on the car from the Arkham knight game but has been redesigned and manufactured with drivability and full functionality in mind. The car is BIG. The wheel base is 3.40 meters and the width of this special car is 2,5 meters. The special high rigid tubular frame is manufactured to provide good handling and give a solid feeling. Front and rear suspensions are fully independent and made with double wishbones connected to the coil over shock absorbers, up front through a special designed aluminum push rod. To power the car, we have used a 560hp V 10 engine connected to a paddle shift gear box affecting the 26″ wheels. To stop the car we have used ABS supported 8-pot Brembo calipers in front and 6-pot in rear all connected to big brake discs. 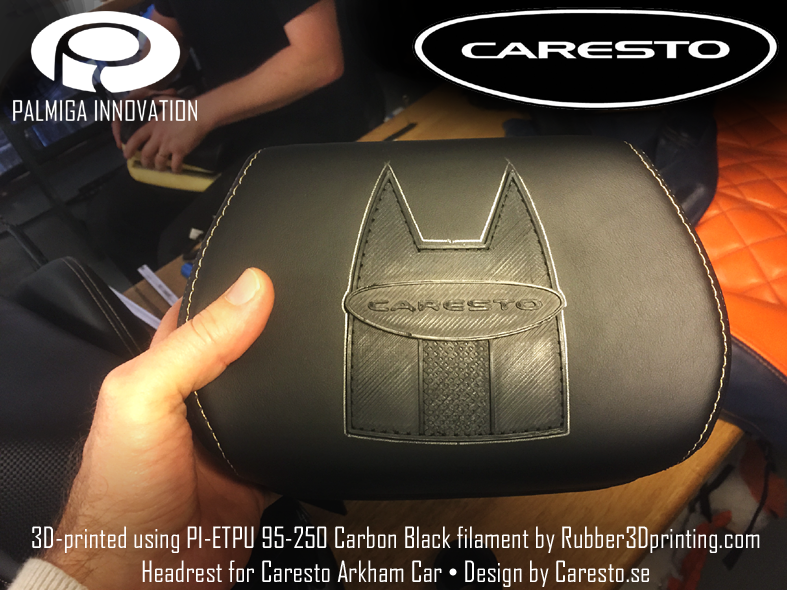 The headrest logos, as well as the center cap for the steering wheel, where 3D printed on a normal consumer 3D-printer using the flexible rubberlike PI-ETPU 95-250 Carbon Black (Rubber3Dprinting.com). The center cap was the most challenging part to 3D print, the big radius convex surface would not look nice using a 0.4mm nozzle… Instead a 0.7mm nozzle was used but the extrusion width was set to 0.9mm to get the layers to look nice with circular rings covering the complete surface. Also the thickness of only 1,5mm and the need for support material made this a tricky job. To show how nice the PI-ETPU 95-250 Carbon Black filament is to use, the same filament was used as support material, using a single extruder 3D printer. The surface of the bat symbol was manually melted with a solder iron and smoothed out using sandpaper, that process was a bit delicate but resulted in the nice structure and contrast needed. 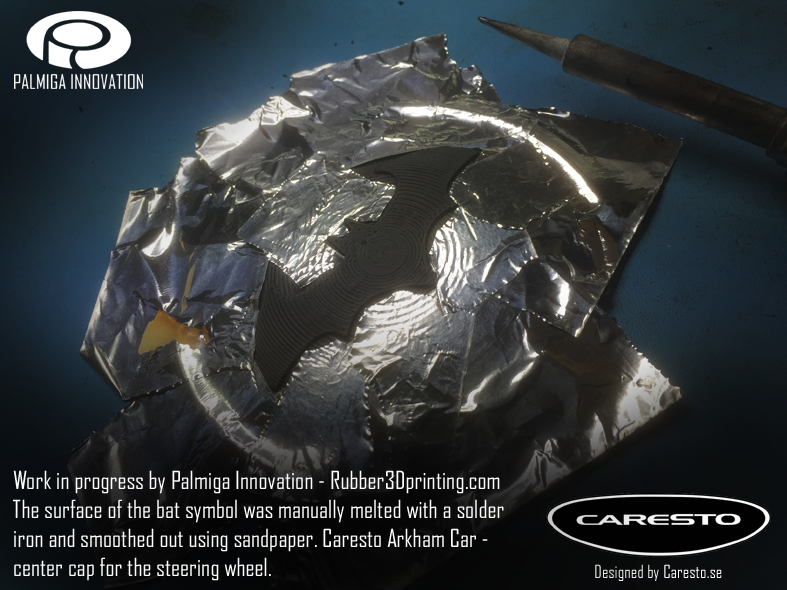 Caresto Arkham Car – The bat symbol was manually melted with a solder iron and smoothed out using sandpaper. To 3D print the headrest parts was rather straight forward when using a 0.7mm nozzle and also a small positive extrusion multiplier to adjust the feel and look, they were printed flat with holes etc ready for the sewing.